The JA New York Chocolate Maker Competition is a daylong business plan competition for middle school students. Volunteers from PwC helped us develop this fun entrepreneurial curriculum in 2005. Through this program, volunteers coach small teams of middle school students as they build a business plan for an imaginary chocolatier company. Students collaborate with each other and with their volunteers to prepare a basic plan (including a SWOT analysis, budget, marketing strategy, etc.) and a creative presentation to pitch their idea. Students practice team-work, leadership, communication, and presentation skills. Students learn how entrepreneurs succeed by identifying a need and then producing and marketing a product or service to fill that need. Students explore the personal entrepreneurial, communications, technological and financial management skills needed to create a go-to-market business plan. Chocolate Makers are generally hosted by partnering companies or universities to heighten the realism and relevance of the experience. Students, with the coaching of volunteers, identify their company name, create a logo & mission statement, research locations, productions, and potential customers, and draft a SWOT analysis. Students work together to create a budget and marketing plan. 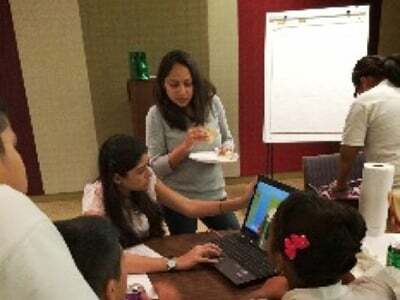 Volunteers help them develop a PowerPoint and rehearse their pitch. Students present their plans to a panel of judges.